Not too long ago, I finally nailed down the method and roasting time for a standard 3 pound pork loin roast. 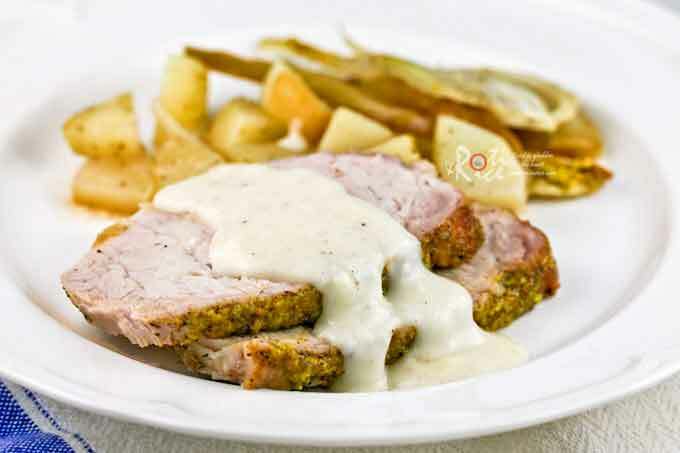 Ever since then, the family has enjoyed quite a few tasty pork loin dinners. 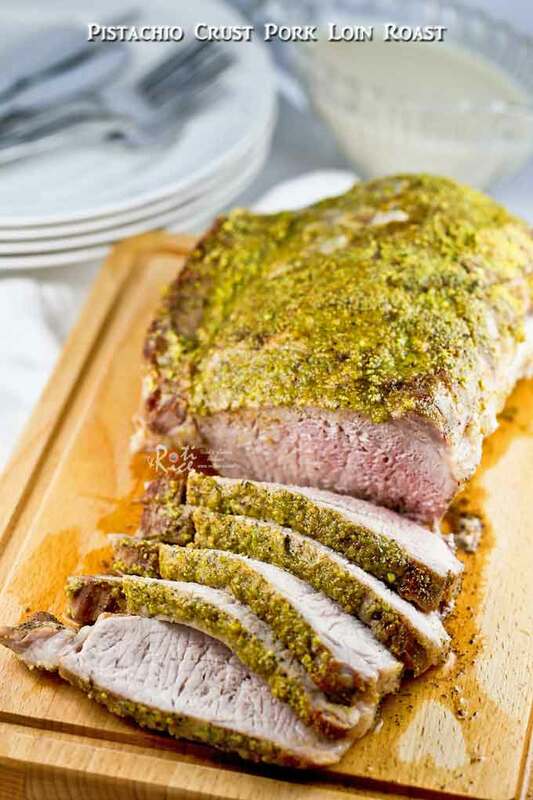 Thus far, today’s Pistachio Crust Pork Loin Roast is our favorite. 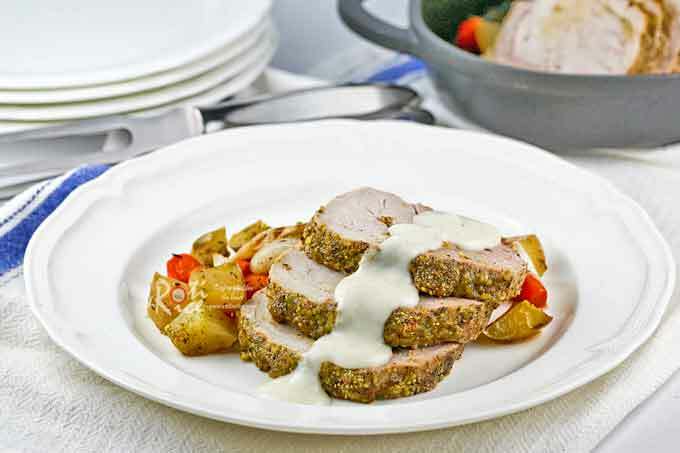 We really enjoy the combination of salty pistachios and mild tasting pork loin drizzled with a creamy horseradish sauce. I hope you will too. 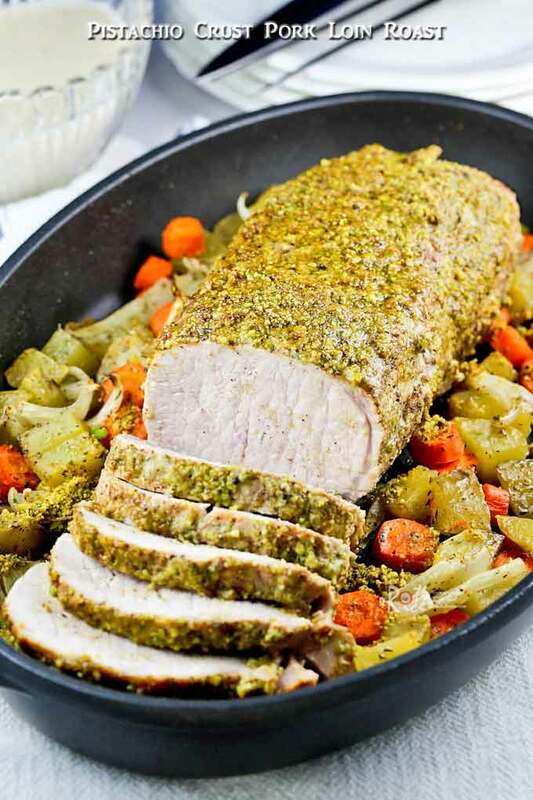 Even though the pork loin is a huge chunk of meat, it only takes 50 minutes to roast in the oven. The important thing is not to over cook it or it will become tough and dry. As soon as the pork loin reaches an internal temperature of 150˚F (65˚C), it is done. Allow it to rest for 10 minutes and you have a juicy chunk of meat for dinner. I like to add vegetables to the pan for a one-pan dinner. The very first time I made this recipe, I used fennel and baby potatoes. Raw fennel has a licorice taste but roasted fennel is sweet and delicious. Definitely give it a try if you have never tasted it before. Otherwise you can use the good ol’ combination of carrots, potatoes, and onions. You can’t go wrong with this trio as this popular combination has been tried and tested over and over again. The pistachio crust in this recipe is a moist one. If you prefer it to be slightly crunchy, you may want to transfer the pork loin under the broiler 5 to 10 minutes before roasting is completed. Brush grill pan with 1 tablespoon vegetable oil. Sear pork loin about 3 to 4 minutes on each side. Combine fennel (or carrots), baby potatoes, onion (if using), 1 teaspoon salt, ½ teaspoon dried thyme, and 2 tablespoons vegetable oil in a large pan. Mix well. 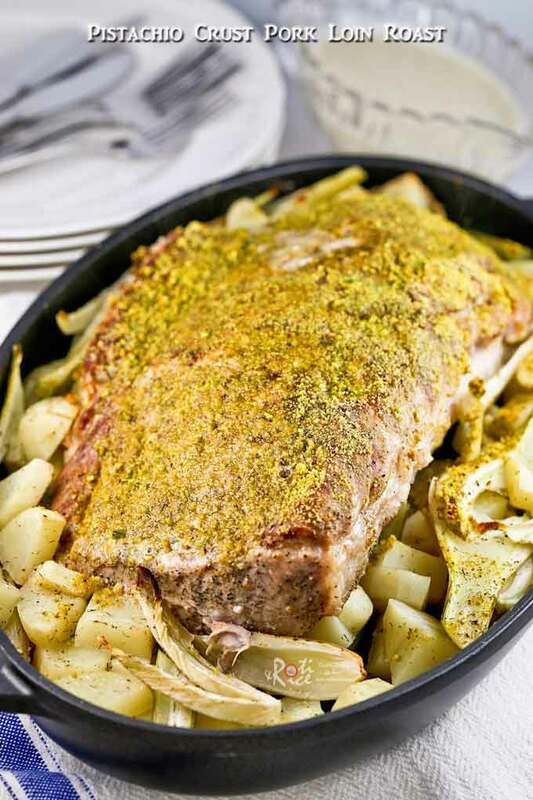 Place seasoned vegetables all around the pork loin in grill pan. Brush remaining 1 tablespoon vegetable oil on the top of pork loin. Pat ground pistachio evenly over the top of pork loin. 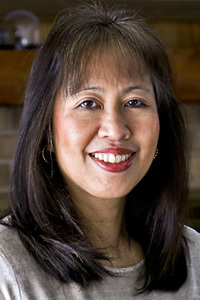 Transfer to preheated oven and roast for 50 minutes or until internal temperature is 150˚F (65˚C). Stir in horseradish, salt, and pepper. Cook until sauce is thick and bubbly. Turn off stove.